Hockey fans love trade deadline day, even though few of us will ever know what really goes on behind the scenes. Well, I decided to find out. So with the help of some top secret internal sources (thanks Cliff! ), I was able to plant several microphones and hidden cameras around the Maple Leafs war room on deadline day. What follows is a never-before-seen level of detail on what an NHL front office looks like on the busiest day of the year. 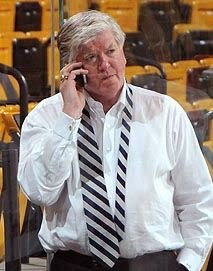 8:45 a.m. - Leafs GM Brian Burke arrives early, and immediately begins furiously working the phones in an attempt to line up his media appearances for the day. 9:24 - Leafs assistant GM Dave Nonis takes a call from a rival GM asking what the Leafs would want in exchange for Luke Schenn. While talks are initially encouraging, they ultimately fail after Nonis is still listing players and picks when the 3:00 deadline passes. 10:00 - Concerned about the recent winning streak and its impact on draft position, Burke meets with Vesa Toskala in the parking lot to suggest that the red-hot goalie should go on the IR. When Toskala protests that he's not injured, Burke nods in the direction of Tim Hunter, who emerges from the shadows holding a baseball bat. 10:05 - Vesa Toskala agrees that he needs to go on the IR. 10:32 - Burke calls Montreal GM Bob Gainey, only to find out that Gainey has taken the day off. 10:57 - For the fifth time that day, a rival GM calls the Leafs front office asking to speak with John Ferguson Jr. and is devastated to learn he no longer works there. 11:12 - Burke calls Panthers GM Jacques Martin to ask for a scouting report on Jay Bouwmeester, his health records, and information on his salary demands. When Martin asks if he can call him back in an hour, Burke says "no problem, I won't actually need any of this until July 1." 11:27 - Struggling somewhat on his first deadline day in a front office, Joe Nieuwendyk accidentally trades himself to the Devils. 11:45 - Disguising his voice, Burke calls Kevin Lowe to ask if Dustin Penner is available, then laughs hysterically at how excited Lowe gets. 12:15 - With a sinking feeling, Leafs assistant GM Jeff Jackson realizes that the note on his desk that reads "Jeff, please pick up Gerber" is not actually in Brian Burke's handwriting, seems to be from his wife, and probably refers to baby food. 12:37 - Burke takes a break to update his hilarious DownGoesBrown twitter parody. 12:56 - A confused Pavel Kubina phones to ask why the guy in charge putting together the Atlanta Thrashers 2009 media guide just showed up to take his picture. 1:05 - The entire Leafs front office gathers around a computer to read Eklund's latest updates on Hockeybuzz, gaining valuable insight into which rumored trades are guaranteed not to happen. 1:20 - Burke steps out for some fresh air. Upon seeing a homeless panhandler pathetically begging for scraps of food and spare change, Burke makes a mental note to start calling southern market teams to see if he can buy their draft picks. 1:45 - A fellow GM calls to ask Burke if he'd be interested in a Lee Stempniak deal. After Burke angrily explains that the last thing he needs is some underachieving fourth-liner, the other GM is forced to awkwardly break the news that Stempniak has been playing for the Leafs for four months. 2:11 - While discussing details of a proposed Nik Antropov deal, New York GM Glen Sather offers to throw in a conditional draft pick if the Rangers make it to the conference finals. 2:14 - After three straight minutes of listening to Burke laugh and pound the table, Sather informs him that he was actually serious about that. 2:42 - In a tragic misunderstanding, Burke responds to Dominic Moore's plea that "I just want to play in front of 19,000 diehard Leaf fans every night" by trading him to Buffalo. 2:57 - With only minutes to go until the deadline, Burke turns down last-minute offers of a second round pick for Ian White, and a first round pick for Ian White's moustache. 3:45 - As he prepares for his post-deadline press conference, the rest of the front office bets Burke that he can't talk about fielding offers for Tomas Kaberle and claim that he never asks players to waive their NTCs in the same sentence without at least somebody in the Toronto media catching on. 5:30 - Sitting alone at the arrivals gate of the Nashville International Airport, a confused Alex Ponikoravsky wonders why nobody is coming to pick him up. 6:30 - Before heading home after a busy day, Burke slides a slice of stale bread under the door of the storage closet where Richard Peddie has been kept chained and bound since November. "Disguising his voice, Burke calls Kevin Lowe to ask if Dustin Penner is available, then laughs hysterically at how excited Lowe gets." moments 12:56 and 5:30 had me lmao! all in all, another hilarious and 'future classic' blog. thanks for the laughs DGB! DGB, you did it again. Golden post detailing the intricacies of draft deadline day. Since I'm here, might as well watch the "All Heart" video. Again. This is gold DGB, loved it. Well done. "10:00 - Concerned about the recent winning streak and its impact on draft position, Burke meets with Vesa Toskala in the parking lot to suggest that the red-hot goalie should go on the IR. When Toskala protests that he's not injured, Burke nods in the direction of Tim Hunter, who emerges from the shadows holding a baseball bat. 10:05 - Vesa Toskala agrees that he needs to go on the IR." I new that stylish fin was tougher than he looks... 5 mins before he backed down. Nieuwendyk tradig himself and the Dominic Moore to Buffalo joke really made me laugh. Great work! I heard Lowe didn't like the steaming bag of "you know what" left outside their war room in Ottawa either. "12:15 - With a sinking feeling, Leafs assistant GM Jeff Jackson realizes that the note on his desk that reads "Jeff, please pick up Gerber" is not actually in Brian Burke's handwriting, seems to be from his wife, and probably refers to baby food."